Arrambide et al. Neurofilament light chain level is a weak risk factor for the development of MS. Neurology. 2016 Aug 12. pii: 10.1212/WNL.0000000000003085. OBJECTIVE: To determine the prognostic value of selected biomarkers in clinically isolated syndromes (CIS) for conversion to multiple sclerosis (MS) and disability accrual. METHODS: Data were acquired from 2 CIS cohorts. The screening phase evaluated patients developing clinically definite MS (CIS-CDMS) and patients who remained as CIS during a 2-year minimum follow-up (CIS-CIS). We determined levels of neurofascin, semaphorin 3A, fetuin A, glial fibrillary acidic protein, and neurofilament light (NfL) and heavy chains in CSF (estimated mean [95% confidence interval; CI]). 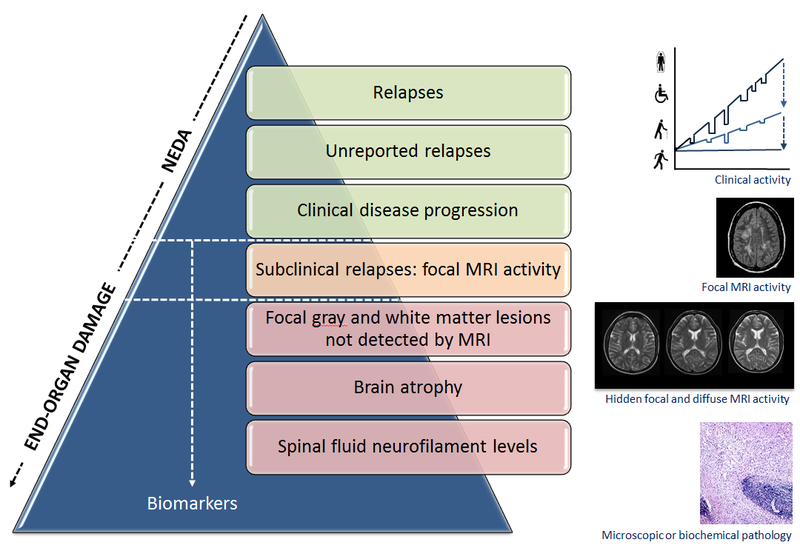 We evaluated associations between biomarker levels, conversion, disability, and magnetic resonance parameters. In the replication phase, we determined NfL levels (n = 155) using a 900 ng/L cutoff. Primary endpoints in uni- and multivariate analyses were CDMS and 2010 McDonald MS. RESULTS: The only biomarker showing significant differences in the screening was NfL (CIS-CDMS 1,553.1 [1,208.7-1,897.5] ng/L and CIS-CIS 499.0 [168.8-829.2] ng/L, p < 0.0001). The strongest associations were with brain parenchymal fraction change (rs = -0.892) and percentage brain volume change (rs = -0.842) at 5 years. NfL did not correlate with disability. In the replication phase, more NfL-positive patients, according to the cutoff, evolved to MS. Every 100-ng/L increase in NfL predicted CDMS (hazard ratio [HR] = 1.009, 95% CI 1.005-1.014) and McDonald MS (HR = 1.009, 95% CI 1.005-1.013), remaining significant for CDMS in the multivariate analysis (adjusted HR = 1.005, 95% CI 1.000-1.011). This risk was lower than the presence of oligoclonal bands or T2 lesions. CONCLUSIONS: NfL is a weak independent risk factor for MS. Its role as an axonal damage biomarker may be more relevant as suggested by its association with medium-term brain volume changes.